Shortly after Stephen Spinelli became president of Philadelphia University in 2007, a two-person welcoming committee arrived at his front door bearing gifts of cupcakes. When the visitors introduced themselves, Spinelli’s response was a simple one. “I already know who you are,” he told university neighbors Arlen and Joan Specter that weekend morning. From that point on — after an hours-long conversation about “life and East Falls” over coffee, tea and cupcakes — a relationship developed that will soon take on a permanent tangible form. 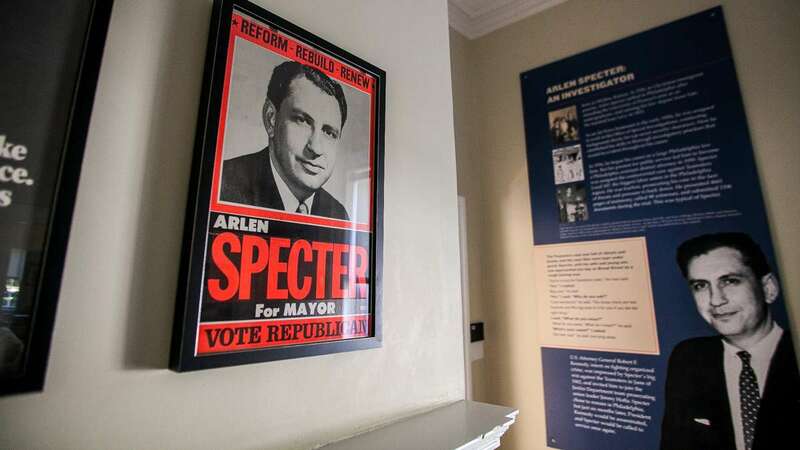 On Sept. 11, the school will host the official dedication of the Arlen Specter Center for Public Service at its newly renovated home, the historic Roxboro House on School House Lane near Henry Ave. 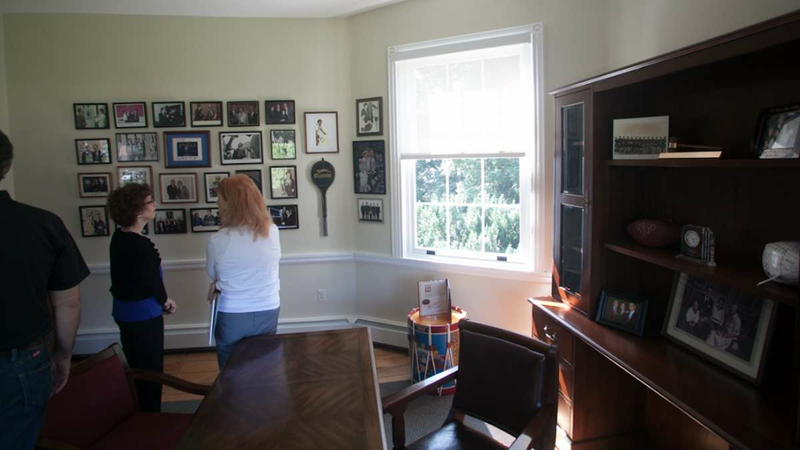 The $4 million project — funded with $1.97 million from Pennsylvania Redevelopment Assistance Capital Program (RACP) and $1.85 million in donations — has transformed an eyesore of a former bed-and-breakfast into something that Spinelli sees as a watershed moment for the university. “In your career as a leader, or in anyone’s life, the very unique events that happen are few and far between. In the history of Philadelphia University, this is an incredibly unique gem,” Spinelli told NewsWorks this week. “We want to do a great job because we have something here that no one else has. It’s awe-inspiring. To hear Spinelli tell it, interactions with the late U.S. senator were frequent. 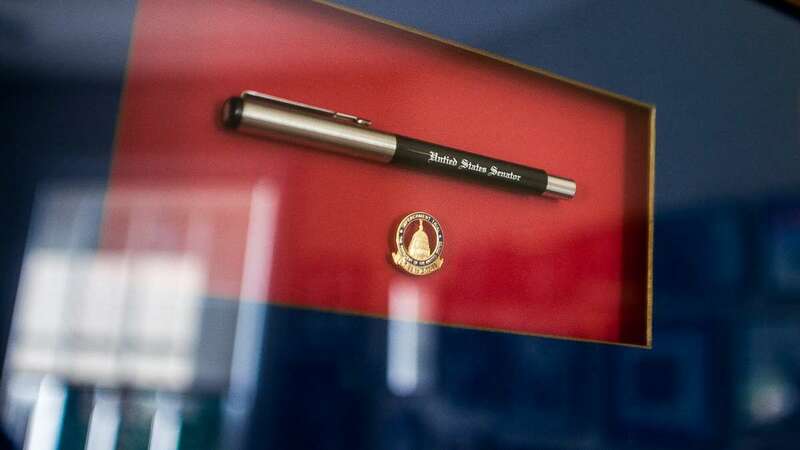 Over the course of many conversations, Spinelli said that Specter asked what the university president thought he should do with endless boxes of papers and documents collected over three decades on Capitol Hill. It was decidedly presented not as a question, but as an order of sorts. At that point, a mission was formed. In Dec. 2010, Specter donated his “his extensive archival collection, encompassing 50 years of public service” to the school. Fundraising commenced and two months after Specter’s Oct. 2012 death, construction soon started. In March 2013, the East Falls school and the University of Pittsburgh forged a relationship through which the latter would manage, organize and digitize the Philadelphia University-owned collection over the course of four years. No fewer than six trucks then hit the Pennsylvania Turnpike loaded with more than 3,000 boxes of documents encompassing some very notable American moments. 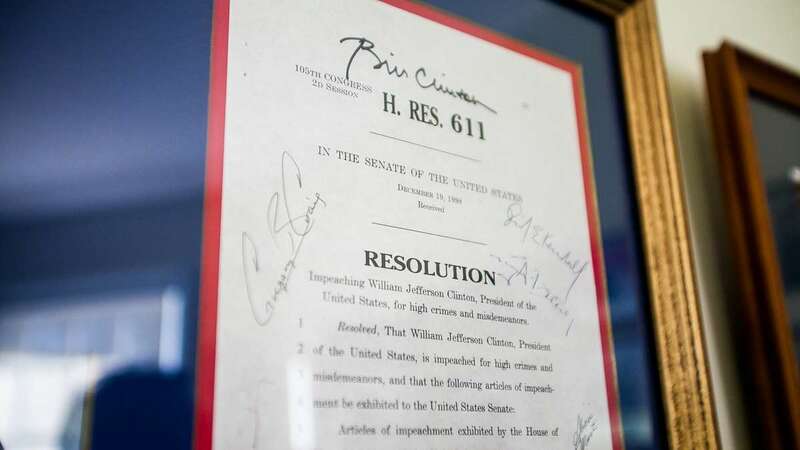 The Anita Hill hearings, the Bill Clinton impeachment process, several Supreme Court nomination hearings and his fight to keep the Philadelphia Navy Yard open are among them. As the documents are digitized for use in research and academic projects here, an ongoing fundraising campaign seeks $1 million for an endowment to support future programming at the site. One recent morning, Evan Laine (director of the center and the school’s Law and Society Program), Karen Albert (director of the Paul J. Gutman Library and center coordinator) and Debbie Goldberg (public-relations director) led a tour of the center as workers toiled away at their finishing touches. Roxboro’s historic status made the redesign a tricky process, they said. 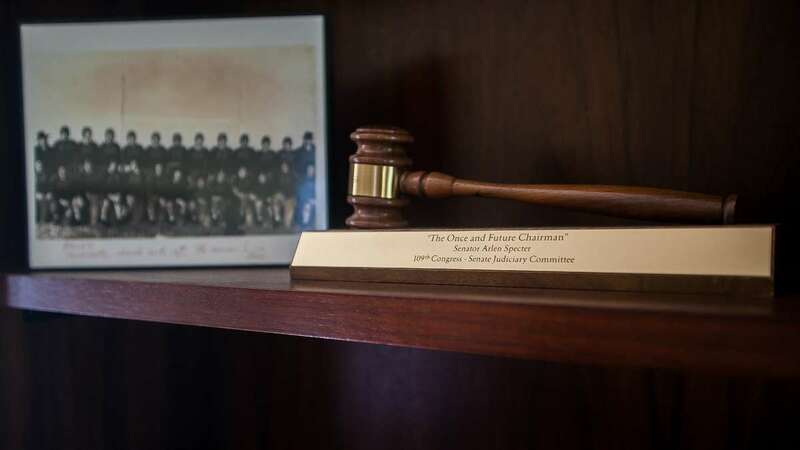 While a Historic Commission plaque and the original boot scraper sit near the entrance, the interior features a new-wood smell and modernized feel. Upon entry is a living room-type area with couches, chairs and a working fireplace; this area will be used for seminars and events. Laine said current-events programming at the center will be an integral part of its mission, and that the community will be invited to attend. Among the impacts that Laine cited is a doubling of enrollment in his classes, which serve as a pre-law political-science major. While the volume of documents is overwhelming, Albert noted that the boxes (and folders) were indexed in such a fashion that makes the digitization process more manageable. On the walls of the center is a collection of photographs, campaign posters and framed newspaper articles reminiscent of a gallery show. 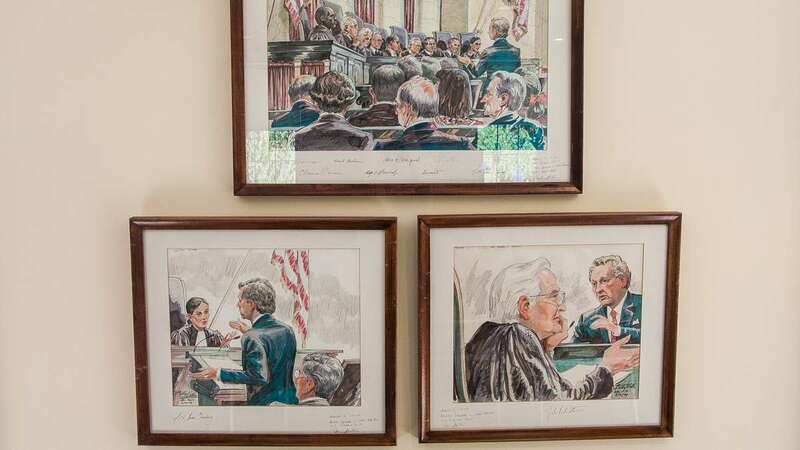 In other room there are courtroom sketches signed by all the Supreme Court justices and pictures of Specter and family with members of the 2008 World Series Champion Philadelphia Phillies. 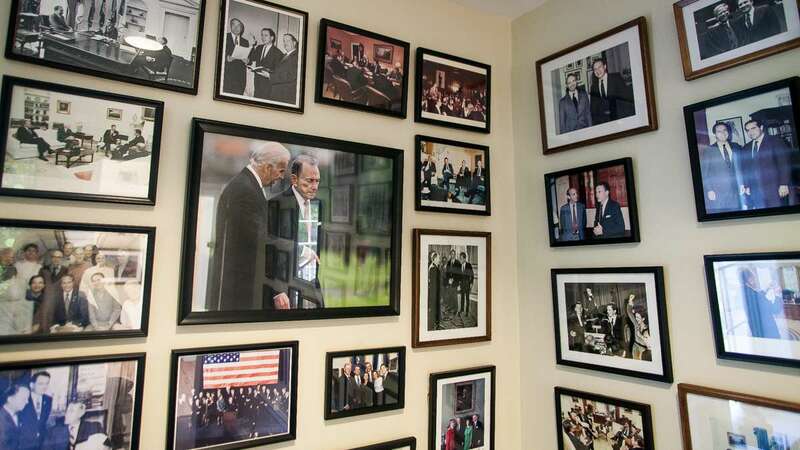 There are also posed and candid shots of Specter with, among many others, a chronology of American presidents since Dwight Eisenhower, Joe Paterno, Jerry Lewis, Lauren Bacall, Mary Tyler Moore, Saddam Hussein, Yasser Arafat, Colin Powell and Syrian leader Bashar al-Assad. But this current photo gallery is not the center’s overarching mission, said Laine. “We are not going to let this become a place where you go just to look at pictures,” he said. Upstairs at the center is a replica Specter office. “When he was still alive, we saw this as a place where he could come and work if he wanted to,” said Goldberg. 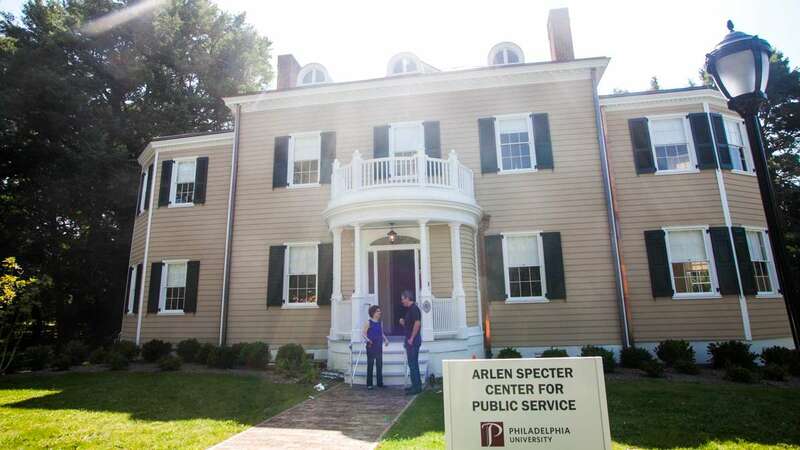 At 3 p.m. on Thursday Sept. 11, Philadelphia will host the official dedication of the Arlen Specter Center for Public Service (3240 W. School House Lane). The event will feature the debut of two new public-services awards given to a current student and an alum. The awards are sponsored by Elsie Hillman, a philanthropist who helped unite PhillyU and the University of Pittsburgh, and Specter’s widow Joan, who has since moved from the East Falls home she shared with her late husband and family. Members of Specter’s family are expected to attend, including son Shanin who donated 150 boxes to the effort. 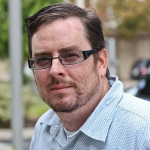 For his part, Spinelli said he thinks the center meshes perfectly with the university’s mission, particularly as faculty aims to establish a curriculum centered on the stories told therein.